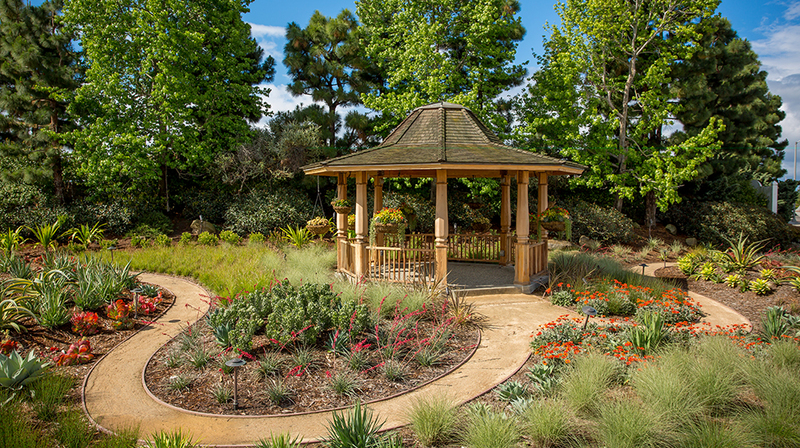 Stroll through the 7-acre grounds at Roger’s Gardens in Newport Beach. Adapted from WHERE Orange County magazine’s spring 2018 issue. 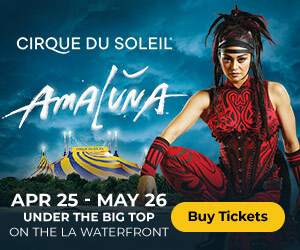 Orange County’s natural beauty is hardly limited to its breathtaking coastline. It is also home to an array of stunning gardens as diverse as botanical retreats, sculpture gardens, even retail nurseries that are attractions in their own right. One doesn’t need be a gardening enthusiast to appreciate these venues—even the most staunch urbanist will savor these reprieves from routine. Make a day of it: Start with a garden, then enjoy a meal and shopping onsite or nearby. This horticultural haven, relatively intimate at 2.2 acres, is right on Coast Highway in Corona del Mar, but for a small sign hidden in plain sight. It was a nursery before it was established in 1955; now it describes itself as a museum of living plants. The flora and fauna from around the globe are seasonal, but the venue, known for its flower beds and hanging baskets, seems to be in constant bloom. Botanical collections range from the desert plant life of the Cactus and Succulent Garden, a hipster’s backyard dream, to the Tropical Conservatory, which displays orchids, heliconias and gingers in all their island glory; stop and smell the cattleya! Hummingbirds zip by at close range. Nearby are staghorn ferns and koi. Culinarians appreciate the herb garden, where they find chocolate and orange mint plants as well as society and tricolor garlic. No surprise that the garden’s al fresco Café Jardin makes good use of those vibrant herbs in “coastal garden” dishes as diverse as house-smoked salmon and Indian-spiced lamb shank. Afternoon tea is offered on the second and last Wednesday of the month—currant and chocolate scones, a quartet of tea sandwiches, tartelettes—with a picture-perfect floral backdrop, of course. The gardens are midway between picturesque Little Corona Beach and Corona del Mar Plaza—where Baker & Olive offers charcuterie, flavored olive oils, balsamic vinegars and anything else you might need for a picnic. Also at the center: GLO Nail Bar, where one of the luxe mani-pedi services include a foot bath with champagne and rose petals. Commissioned by the late Henry T. Segerstrom, the mogul behind South Coast Plaza and the Segerstrom Center for the Arts, California Scenario in Costa Mesa is artist Isamu Noguchi’s homage to California landscapes. The 1.6-acre sculpture garden—also known as the Noguchi Garden—is a cultural treasure tucked away among Town Center’s glass office towers. The garden is both minimalist and dramatic. Its centerpiece, The Spirit of the Lima Bean, is a 12-foot grouping of large interlocking stones, a nod to the area’s agricultural roots. The genesis of those roots lay with his grandfather, but Segerstrom was the visionary who transformed the land. That work is just one of the installation’s constructs. The others are Forest Walk, Land Use, Desert Land, Water Source, Water Use and Energy Fountain. Water elements throughout the space lend themselves to peaceful meditation; all elements lend themselves to photography. After replenishing your spirit, you can replenish your body at any of a number of superior restaurants within walking distance. Enjoy steaks at Mastro’s, the back of which looks out onto the garden; tapas and paella at Top Chef alum Amar Santana’s Vaca; and seafood at beautiful Water Grill. South Coast Plaza adds 40 more dining options—and hundreds of boutiques, among them Webster, Stella McCartney, Dior Homme, Les Parfums Louis Vuitton and SoCal-centric Vans footwear. 611 Anton Blvd., Costa Mesa. Can a retail nursery be a visitor destination? That certainly seems to be the case at Roger’s Gardens. Visitors come by the busloads—literally—to see what the high-end retail center has on display each season, especially during holidays. It’s easy to spend half a day strolling through the 7-acre grounds, which features fresh floral stations, a whimsical gift shop, fascinating designer fountains and, of course, creatively designed gardens for those seeking inspiration for their own backyards. Roger’s Gardens is even more of an attraction since its Farmhouse restaurant opened last year. Helmed by local veteran chef Rich Mead, the spot is open for lunch and dinner, offering field-to-fork dining using locally sourced ingredients as well as wine, craft beers and cocktails. Those looking to shop might check out new boutiques at nearby Fashion Island: Zadig & Voltaire and St. John for women, Rodd & Gunn and Robert Talbott for men. Explore the county’s largest botanical garden at Cal State Fullerton. On what was once an ailing orange grove at Cal State Fullerton is Fullerton Arboretum, the county’s largest botanical garden with 4,000 plants on 26 acres. Wide trails flanked by ponds and streams take visitors through four distinct plant collections: cultivated, woodlands, Mediterranean and desert (whose cactus flowers bloom in spring). 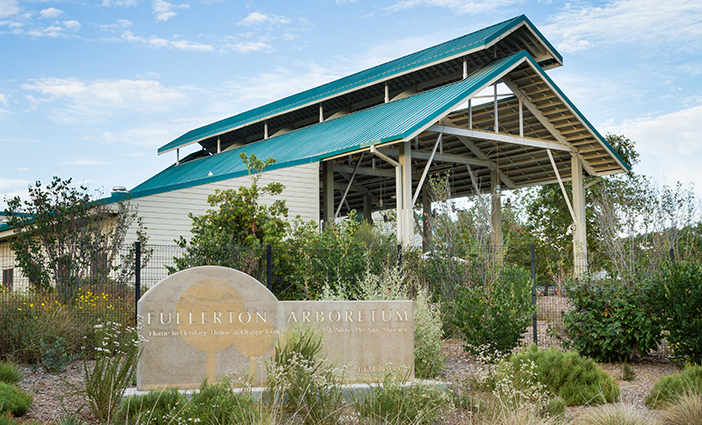 Areas of special interest include a subtropical fruit grove and the native plants of Thorn Forest; among recent additions is a wildflower exhibit. The arboretum offers classes as diverse as home composting, pruning of roses and cooking with local ingredients. On weekends, you can take a guided tour or visit the 1894 Heritage House at the center of the venue. Surrounded by flower and vegetable gardens—of course!—the cottage was built by Fullerton’s first physician. Now it’s a museum of turn-of-the-century county history. A windmill and outhouse were added along the way to better portray life at that time. Nearby Summit House is a fine-dining landmark known for its impeccable service and outstanding prime rib. You’ll find oodles more dining options—and vintage clothing boutiques—in downtown Fullerton. The UCI Arboretum is UC Irvine’s 12.5-acre botanic garden and research facility. Its initial focus on South African plants in the 1970s expanded to include endangered plant species and a wealth of exhibits spotlighting what is known as California’s floristic province; those include Baja California, the Channel Islands, native grasslands and wildflowers, the Mojave Desert and the more obscure Maritime Succulent Scrub and Otay Mesa. The venue continues to boast one of the finest collections of African wild flowering bulbs and aloes anywhere. Nearby University Center offers dozens of fast-casual destinations, notably Adya for new takes on Indian street food, Mendocino Farms for creative sandwiches and Spoletto for design-your-own pasta. The good volunteers of the Huntington Beach Tree Society have turned a neglected community garden into one of the county’s coziest sanctuaries. Immaculate granite paths and scenic river-rock dry streams lead through a small collection of trees, succulents and other drought-tolerant plants. Though its name implies that it might be concealed or hard to access, it’s not: The nearly acre-long plot is right behind the Huntington Beach Public Library and ideal for reading a book on a bench amid the flora. Speaking of benches, the Park Bench Café, a family-owned eatery also in Huntington Beach Central Park, offers breakfast and lunch. Dogs are welcome; owners can order for them from the Canine Cuisine menu. On the coast, not far, is Pacific City, a sleek new retail and dining destination. You can shop at Sephora and Kin boutique; dining options include Burnt Crumbs in Lot 579 for creative sandwiches, the American Dream for burgers and beer, and Bluegold for chef-driven fare and cocktails.